What Can You Do in Three Weeks? We are now at the point in our Ironman training, where we either have it or we don’t. We did our hardest weekends of training last week and this week. Last week, in addition to our weekday workouts, we did a 109-mile bike & 3-mile run brick, followed by a 16-mile run the next day. This Saturday, we did a 62-mile bike & 5-mile run brick, and Sunday, we did an 18-mile run. Now, we start to back off. 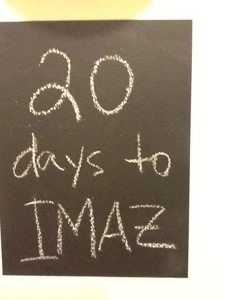 We now have 20 days until IMAZ. I had wanted to work up to a 20-mile run, but it just didn’t happen. I am listening to my body, and it’s saying that anything more will lead to injury. I think Craig feels the same way. Bonking – This is when an athlete runs out of steam and hits the proverbial wall, making an imaginary, but deafening, “bonk” sound. We don’t want this to happen … Ever. Big chainring/ small chainring – These are the circular cog-like things on a bike that the chain latches onto in order to make the bike go when you pedal. The big one is in the front, and the small one is in the back. We got mine sorted out, by the way. Craig (my husband) figured out that the place where I change gears was not acting right, and he fixed it. Yay! Nutrition – You’d think that we use this term to just talk about what we eat all the time, like most people. But actually, inTri-speak, this refers to just what we eat while we are training or racing. You see, the body wasn’t really made to eat on the run (or on the ride). When you’re exercising, your body wants to focus on the exercise, not on digesting stuff. But in order to keep racing through the breakfast, lunch, and sometimes dinner times of the day, you have to eat while you’re on the go. So, there are various sports foods out there, designed to make this easier. Even so, they don’t work equally well for everyone. So, that’s why you’ll hear triathletes talk about “dialing in” their nutrition. It’s one of the hardest things to do in long-distance triathlon. By the way, I tried out the liquid Perpetuem on our long brick this past weekend, and it worked better than the solid tablets for me. Brick – I just used this term in the sentence above and failed to explain it… A brick is typically a bike-run workout, but it can be any of the three triathlon disciplines strung together. You can do a swim-bike brick, for example. The idea is to get used to doing these things one after the other with no real break in between. Racking the bike – When you do a race, you have what they call a Transition Area, where all the athletes’ bikes are set up for them to grab and jump on after the swim. The bikes are hooked onto racks, so they stay upright. The athletes typically rack their own bikes (i.e., set up the bikes) themselves before the race, and they place all their accessories on the bike – ready to go. A lot of thought goes into this process, because you want to make sure you have everything you need and that it’s easy to get to quickly. Spending a lot of time in the Transition Area between the legs of a race is frowned upon, since that time counts toward your overall time in the race. T1, T2 – the T stands for Transition, and the first one (T1) stands for the transition from swim to bike. So this is when you come out of the water, take off your wetsuit, if you’re wearing one, and put on your helmet, shoes, etc. for the bike. T2 is when you transition from bike to run… Remove helmet, bike shoes, put on run cap and run shoes, etc. You will hear triathletes talk about how things went in T1 or T2… This is what they are talking about. We also get split times for while we are in transition. These are the times for how long we spent there. We don’t like these to be long, as I said above. Chips & Split Times – With modern technology, the race organizers are able to track everyone’s time via a chip that you wear around your ankle. “Timing mats” are placed throughout the race, by each transition, and at the finish line, to record your time. Wherever there is a mat, the chip registers a “split time” for you, indicating how long it took you to get to that mat after you crossed the previous mat. This is how it is possible to know how long each leg of the race took and how long your T times were. Okay, that’s all the terminology I can handle right now. But if I think of more (I’m sure there’s more.) I will include it in a future blog. I also wanted to correct my last blog and say that IMAZ has changed the run from a three-loop course to a two-loop course. It bothers me a little, because I had my mind set on a three-loop course, where we would see our “cheer squad” at least two times before the finish. But I am getting used to the two-loop idea, and I know it might be easier to handle psychologically. Maybe. We’ll see. Ok, it wasn’t that bad, but I figured it was an eye-grabbing headline. With 10 weeks to go until Ironman Arizona, we did the second century ride (100 miles) in as many weeks yesterday. It was the Indianhead 100, in southern Maryland. It was going well until, 20 miles in, we were taking this gravel road down to the first rest stop, and I stupidly leaned over while pointing out a pot hole to other riders, lost traction, and went down. Gravel does that. And you know what else it does? It makes nasty road rash. I have some to prove it. This is the point at which I realized that I hadn’t worn my cycling gloves. And I must have put my hands down while falling, because they got the worst of it. Skin removed. Dirt lodged in every possible crevice. Bloody, oozey, goop, which got on my jersey. And this wasn’t just any jersey. It was the jersey I’m planning to wear at IMAZ. Oh well. I also got beat up on my right forearm and right leg (and possibly a little on my chin. I dunno… It feels weird). But the hands are definitely the worst part. Now, I know what it’s like to ride 80 miles with road rash. So, the bad luck didn’t stop there. Somewhere around maybe 38 miles in, I got a rear flat. Ok, no biggie. This is actually good. I get the chance to practice changing my own tire. Craig bit his tongue, trying not to help me. I learned some things. Unfortunately, the CO2 cartridge didn’t work right. So, we had to re-do that. But then we got on our way. Until… About two miles later, another flat. We took the tire and tube off. Rescanned the whole thing. We could see a couple gashes in the tire, but they didn’t seem to go all the way through, and we couldn’t see any debris in there. I tried changing it again by myself, we had more CO2 cartridge issues (I need a different mechanism for the valve), and Craig couldn’t be patient anymore… So, he took over. Only trouble was, we were out of CO2, and we didn’t have a pump. Luckily, another cyclist came by and gave us one of her CO2s. We got back under way and made it to the 45-mile rest stop. It had a great Potomac River view and good food, etc. But I didn’t want to stick around. I already felt like we had wasted the day, and I knew it was going to just get hotter the longer we were out there. So, we headed out, knowing the most challenging hills of the ride were still to come (they are all in the last 30 miles or so). At mile 55… Yep, another rear flat. At this point, we know the tire is toast, and we are out of supplies. So, we called the SAG wagon number, thinking we would just throw in the towel. The SAG guy came about half an hour later. He was really nice and very skilled. He searched the tire over and over, and finally pinched out a tiny piece of glass that was lodged deep in one of the gashes. He patched the two spots with duct tape (on the inside of the tire) and got us back on our way.